Free Hyper-V Backup Tool From Altaro is quite nice offering from Altaro for Windows 2008 R2 users to backup their virtual machines. 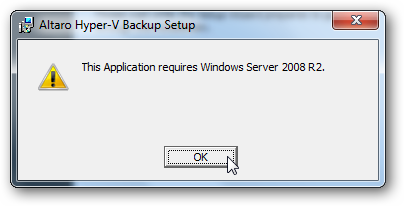 Kindly note, this is for taking backing backup of Hyper-V not Windows 7 personal computer. Previously we published an article on Virtualization with Hyper-V and Memory Paging File, except that all of our articles on Virtualization is actually related to UNIX based machines. This Free Hyper-V Backup Tool post is the second news type article on Windows based Virtualization. Altaro has other softwares for consumer backup purpose. This Free Hyper-V Backup Tool gives you the chance to take backup of 2 VMs, forever, for free, while the paid version is more featured rich but free one is not really bad for small servers. After practical work with standard server softwares, it appeared to us this free Hyper-V Backup Tool is quite unique from the crowd. The intuitive interface is quite easy to follow to take backup and probably it will be easier for any small company to train their employees how to use this free Hyper-V Backup Tool. This Article Has Been Shared 9965 Times! Cite this article as: Abhishek Ghosh, "Free Hyper-V Backup Tool From Altaro," in The Customize Windows, February 5, 2012, April 21, 2019, https://thecustomizewindows.com/2012/02/free-hyper-v-backup-tool-from-altaro/.